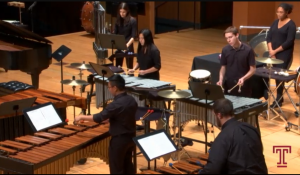 Watching a percussion ensemble can be unlike watching any other type of concert! For one thing, there is the physicality of seeing musicians move around between instruments. While we often think of music in more abstract terms, there is increased interest in the twenty-first century among music scholars in thinking about the physical relationship with a musical instrument (Abbate 2004; Le Guin 2006). The visual element of seeing musicians move around among elaborate set-ups of instruments contributes to the fun of the performance. Another exciting difference is that while most Western music tends to prioritize thinking about pitch over other aspects of music, percussion music celebrates and can help us listen more carefully to other elements of sound, such as rhythm, timbre, and volume. Of course, there is plenty of pitch in percussion music as well. The composers represented in the program are Jason Treuting, Ivan Trevino, John Cage, Bob Becker, and Minoru Miki. Of these, John Cage is probably the most well-known. Cage is especially appreciated for his aleatoric works, compositions in which elements are left up to chance. He is also known for prepared piano music, in which performers place objects inside the piano before the concert to alter the sound. This concert will include music for prepared piano. While Cage is sometimes credited as the inventor of the technique, Liang Deng argues that the practice of preparing a piano actually dates to early keyboard music of the 17th century (2015). 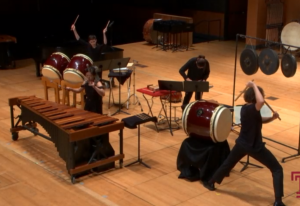 All four of the other composers on the program are known for founding or co-founding their own percussion ensembles. Treuting is a percussionist and member of percussion ensemble Sō Percussion. The ensemble is known for performances of Cage and of Steve Reich, and their original music is described as influenced by those composers but also very distinct (DelCiampo 2015). Trevino is also a percussionist and member of Break with Reality, a cello and percussion quartet, and also a founder of The Big Trouble, which he describes on his website as “a songwriting collective focused on creating music for percussion and vocals in an indie-rock aesthetic.” Miki was a composer known for uses of traditional East Asian percussion instruments. In 2008 he published a book on composing for Japanese instruments [available at Paley]; he died in 2011. Miki too was an organizer of an ensemble; the Ensemble Nipponia was founded in 1964 and played music for traditional Japanese instruments (Kanazawa 2001). He composed a large body of works including a number of operas plus works for orchestra, chorus, chamber ensembles. Finally, Becker co-founded the ensemble NEXUS in 1971 (Beck and Strain 2012). 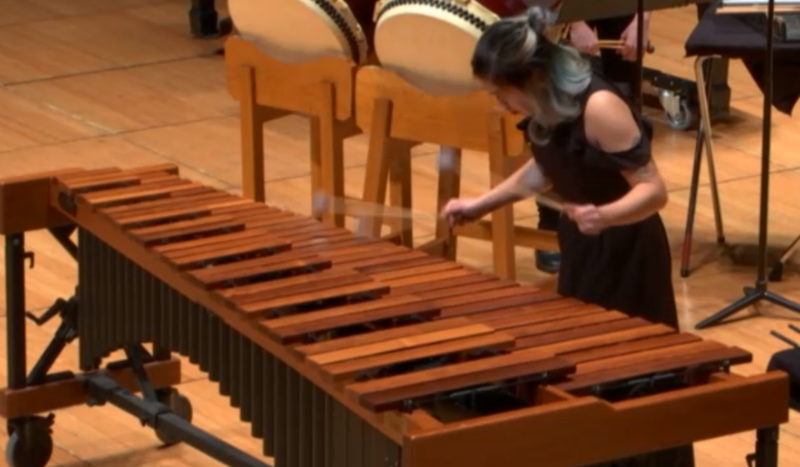 All told, this concert features composers with roots from Japan [Miki] to Mexico [Trevino], while Cage and Becker were both heavily influenced by East Asian and South Asian sounds (Ruby 2017; Brett 2009). This makes sense. While the origins of most instruments in the orchestra may be fascinating and complex but are most commonly Eurocentric, the origins of instruments in the percussion section are especially diverse. There exist commonly used percussion instruments in modern and contemporary classical music from most populated corners of the world. Such intercultural borrowing deserves close examination. Neil Ruby critiques Cage specifically as Ruby argues that “contemporary music often perpetuates pervasive attitudes and assumptions regarding the relationship between spirituality, Asia, and artistry that are historically amnesiac, culturally reductionistic, and perversely antithetical to the progressive egalitarian values typically associated with musical interculturalism” (2017). On the other hand, Philip Brett speculates how alternative instrumentations, tuning systems, and Orientalism itself might have held a special allure for gay American composers of the 20th century, including Cage. While noting that Orientalism is still problematic, Brett sees it as a potential strategy used by queer composers for escaping the traps of western cultures. This building of musical “alternate worlds” that Brett suggests—perhaps friendlier to those on the margins of society—through reference to non-Western culture can also be done through instrumentation, specifically the construction of less familiar, more adventurous ensembles. 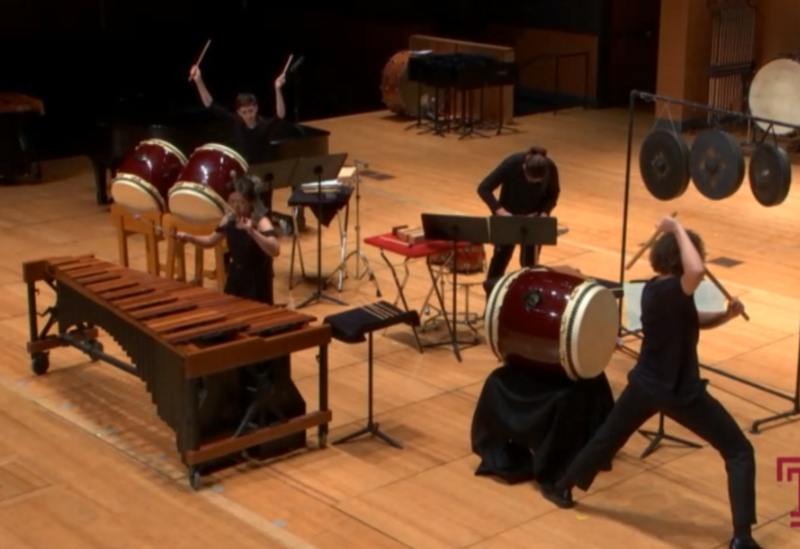 This brings us back to the question of how percussion ensembles are different from others that perform “classical” music. The best way to find out will be to experience the concert firsthand, and to focus on the aspects of music that we normally think about less, from timbre to rhythm to the visual of performers’ movements on stage. Abbate, Carolyn. 2004. “Music—Drastic or Gnostic?,” Critical Inquiry 30: 505-36. Beck, John H., and James A. Strain. 2012. “Percussion music.” Grove Music Online. Accessed November 7, 2018. http:////www.oxfordmusiconline.com/grovemusic/view/10.1093/gmo/9781561592630.001.0001/omo-9781561592630-e-1002225030. Brett, Philip. 2009. “Queer Musical Orientalism.” Echo: A Music Centered Journal 9 (1). DelCiampo, Matthew. 2015. “So Percussion and Grey Mcmurray, Where (we) Live. Cantaloupe CA21087, 2012, CD.” Journal of the Society for American Music 9 (4): 515-517. doi:http://dx.doi.org.libproxy.temple.edu/10.1017/S1752196315000462. Deng, Liang. 2015. “On the Debate over Whether ‘Prepared Piano’ was the Invention of John Cage.” College Music Symposium 55. Le Guin, Elisabeth. 2006. “‘Cello-and-Bow Thinking’: The First Movement of Boccherini’s Cello Sonata in E-flat Major, Fuori Catalogo,” Boccherini’s Body: An Essay in Carnal Musicology. Berkeley: University of California Press, 14-37. Kanazawa, Masakata. 2001. “Miki, Minoru.” Grove Music Online. Accessed 7 November 2018. http:////www.oxfordmusiconline.com/grovemusic/view/10.1093/gmo/9781561592630.001.0001/omo-9781561592630-e-0000018649. Miki, Minoru, and Marty Regan. 2008. Composing for Japanese Instruments. Rochester, NY: University of Rochester Press. Ruby, Neil. 2017. “Spirituality and Orientalism in Contemporary Classical Music.” M.A. thesis, University of California, San Diego. This entry was posted in Beyond the Notes, Performing Arts News and tagged Beyond the Notes, classical music, concerts, drums, free music, Noontime Concert Series, percussion, Top News. Bookmark the permalink. Trackbacks are closed, but you can post a comment.